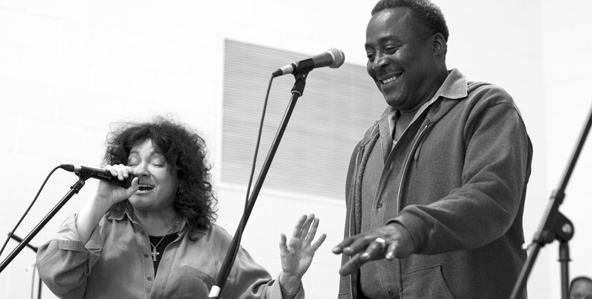 Rita Chiarelli and Ray Jones in Music from the Big House. During the 1880’s, a former Confederate army officer named Samuel James persuaded the Louisiana state government to let him lease convicts (most of them black) to work his plantation, known as “Angola”, because it was believed that the slaves who once worked there were from that country. After James died, the Louisiana State Penitentiary was built on the site. It was commonly known as Angola Prion. It is said that conditions there were horrendous. It is also believed that the prison played a role in the development of blues music. Leadbelly and other musicians spent time there as prisoners. The Canadian musician, Rita Chiarelli, visited Angola while she was doing research on the history of blues music. She discovered that some of the prisoners there play blues or country music. She decided to organize a concert in which she would perform with these men. This took a certain amount of courage, considering that these men were convicted of violent crimes. Most of them are serving life sentences. Although conditions at Angola have improved since the early twentieth century, it is, like all prisons, a grim place. In one scene we are shown the area in which Jones lives. There are about fifty bunk beds lined up in rows. The prisoners keep their belongings in wooden boxes at the foot of their beds. They have no privacy. We are told that this is actually one of the better parts of the penitentiary. Prisoners are moved here as a reward for good behavior. The concert scenes are wonderful to watch. Chiarelli is an appealing person, and she develops a real rapport with the prisoners. At a time when there are incessant calls for increasingly harsh punishments for crimes, it is refreshing to see a film that argues for the possibility of human redemption. This entry was posted on June 23, 2012 at 8:02 am and is filed under Cinema, Crime, Music, Popular Culture, Prisons. You can follow any responses to this entry through the RSS 2.0 feed. You can leave a response, or trackback from your own site.